Being an aficionado of the Great Patriotic War (a.k.a. Germanys WW II Eastern Front) conflict of 1941-1945, this five-turreted, 9.7 meter (31 foot) long, 3.5 meter (11.4 foot) tall, behemoth of a tank has long been one of my favorite subjects. To assist the modeler with some potential diorama ideas, I offer a little historical perspective first. Historical information will influence your display markings, painting and weathering that you choose. For example: no T-35s entering Berlin in 1945 with a IS-2 next to it! 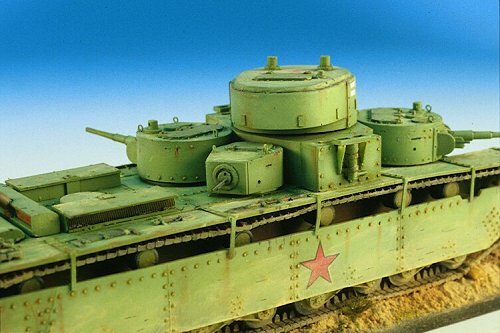 During the early 1930s the idea of the heavy, multi-turreted "breakthrough" tank was considered, and spawned the British Independent tank, and the Soviet T-35. The T-35 was the only one of the two to actually reach production and service. Development began in 1930 and production continued from 1933 through to 1939, with final total production of about 61 tanks over the seven years. 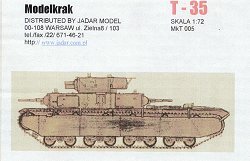 For those modelers familiar with ICMs 1/35 scale T-35 kit (a February-April 1939 version?) 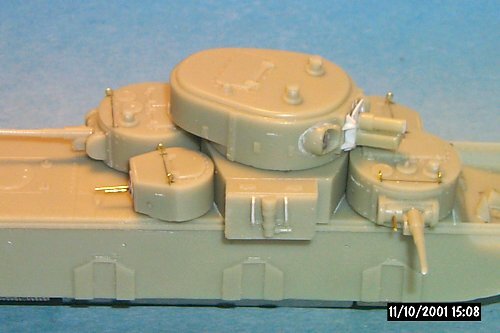 you will note that there are some distinct differences between the two T-35s depicted in these two kits. 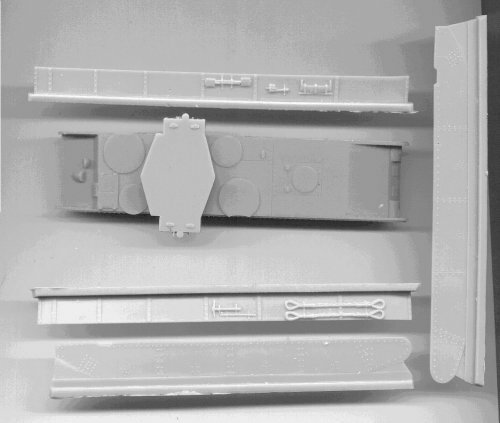 One of the most prominent differences is two hatches atop ICMs main turret, and one large hatch on Modelkraks kit, which is an earlier, 1936 version. Later, 1938-1939 versions of the T-35 had slightly sloped, conical-shaped turret sides. Overall, the length and 50,000 kg weight of this AFV made it hard to maneuver, and the tank commander had an overwhelming job of trying to command the vehicle and five separate turrets with weapons. Despite an impressive appearance, the armor was also relatively thin and vulnerable to even to the German light 37-mm Pak 36 AT gun. In July-August of 1941 most T-35s appear to have been lost due to mechanical failure and in the most common wartime photos I have seen of them, they are often abandoned on the roadside. For further historical information please refer to the references at the end of this article. The model consists of approximately 80 very well rendered, amber, cast-resin parts. This includes one central 76.2-mm howitzer turret, two smaller 45-mm high velocity gun turrets, and still two smaller rifle caliber machine gun turrets. 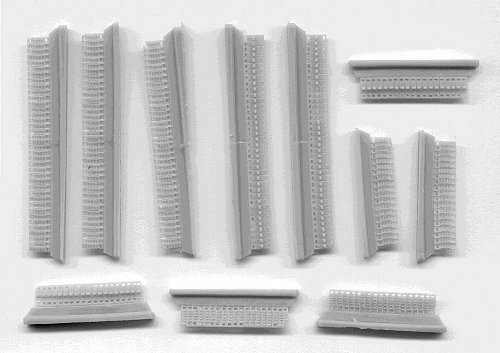 The tracks are resin cast with precisely defined guide-teeth, in two different lengths, and with plenty of extra. Hand tools and tow cables are molded onto the fenders but these are undercut and done capably. There are plenty of small rivets all over the side skirts, turrets, hull and chassis and these too are done very well and in-scale. More information and opinions on the kit and casting will come with the progressive construction of the model described below. The scans below do not include all the small parts, such as all of the 16 main bogie parts and 14 return rollers. I give Modelkrak great credit and thanks for including instructions, something many resin kits do not have. 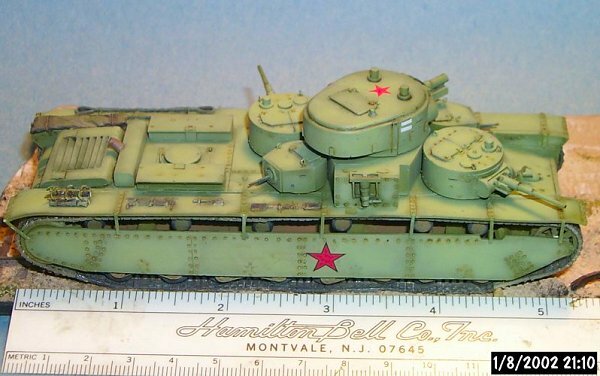 I think the instructions could be better though, and I honestly say that I could not have assembled an accurate T-35 model without my references. 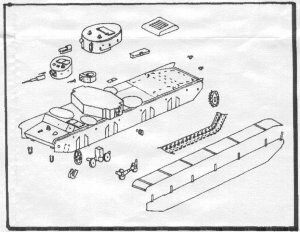 The kit instructions shown below are the "exploded view" kind but do not show all the parts, and the exact locations for some parts are unclear without other references to look at. 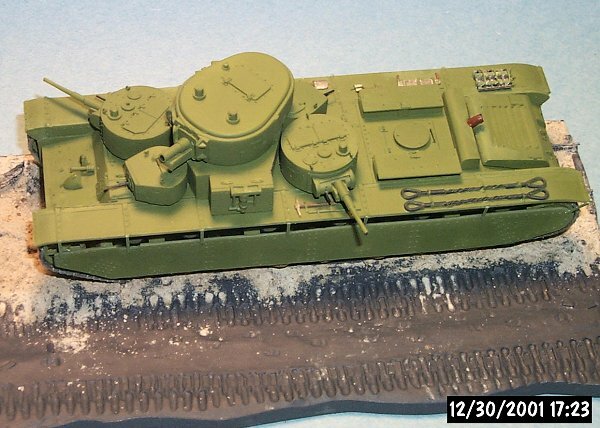 I had an unbuilt ICM 1/35 scale T-35 that a friend lent me and that was invaluable during construction. An inventory list of parts will help in identity, part names, and to know if something is missing. 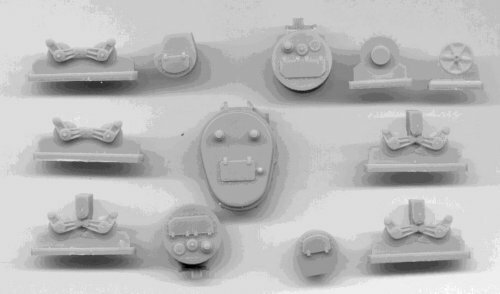 The 16 bogies (for a total of eight pairs of roadwheels with suspension) were the most difficult item to clean the casting blocks off. They were cast very well though and I can see no other way for Modelkrak to have cast them without making many smaller parts to assemble. Use a sharp razor-saw and a lot of patience. Do not rush any part of this model! Be prepared to break several pieces of the suspension while cutting off the extra resin; I did. Photo 6. Left side of the partially assembled kit, minus rear drive-sprocket, tracks, turrets, etc. The light green is liquid mask over areas to be glued later on and I did not wish painted. Faintly visible are pieces of white styrene where I added missing or broken parts. Note the broken right front fender piece, something I had to reproduce in styrene sheet and graft in to both fenders. The dark gray circle on the engine deck forward of the muffler is a raised engine cover I had to produce out of styrene sheet. This, and most of the following photos were taken by me using a tripod mounted Kodak 260 digital camera under the cameras flash only for light. 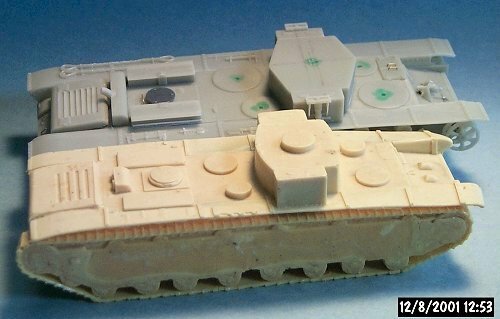 Resin casting blocks must also be cut off the turret and hull bottoms. Cut off all casting blocks and clean-up edges before any assembly. For this grueling job I used a sharp, new hacksaw blade periodically immersed in water to keep down (reduce) the nasty resin dust. Be gentle in how you hold the pieces while you cut so as not to break small parts or saw off fingers. Below are some tips on assembling this resin model. Some tips are recommended, while some are critical. My feelings are that with the cost, detail and complexity of this kit, why not do the best you are capable of. 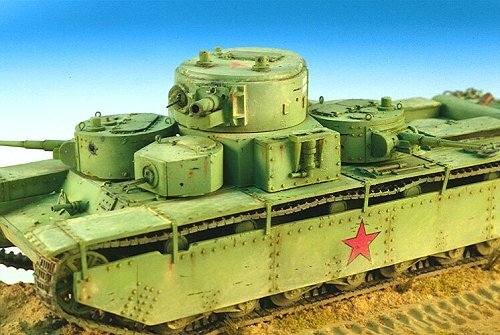 If you wish a tough, simple T-35 kit, for War Gaming or to practice building resin kits, I recommend Red Stars less expensive 1/76-scale resin T-35. Remember: Dry-fit twice, Glue once! Wash the parts in soapy water and rinse well to remove any dust and leftover casting lubricant from the parts. For most parts I used cyanoacrylate glue (Super Glue, Crazy Glue, etc.) in liquid or gel form. For attaching bogies and other parts you may need to wiggle around into proper position I recommend 5-Minute Epoxy. I attached the turrets with white glue so they could be removed and repositioned later on, if I wish. In preparation for construction I located the centers of the turret bottoms and hull turret locations and drilled holes for guide posts. Also drill small holes for the lifting handles on the drivers hatch and engine hatch. Drill holes for the turret gun sights in the mantlets, using your references as guides as to the locations and diameters of the holes. In the turret sides, drill the pistol ports. Drill deeper and wider holes for locating the 14 return rollers on the sides of the hull. The molded-in locating holes I found are too shallow and narrow. Scribe the weld seams in the hull parts and turrets, as seen in references. The headlights in front of the drivers visor are molded onto the hull, one up and one folded down in the protected position. Both of these need small pieces of plastic to imitate brackets. You could add after-market clear lenses over the headlight. I chose painting the lens silver and then adding a drop of Krystal Klear to add depth. I scratchbuilt the five turret machine guns from brass wire which was a little truer to scale than the resin mgs supplied in the kit. The resin machineguns are okay to use but are fragile (and I was missing two, which was my fault). Prior to gluing the tracks, track skirts, and turrets in-place I gave the model its base coat of green (See Photos 8 & 9). Again: Dry fit all parts before gluing. Photo 8. Left side of tank with base coat of Vallejo acrylic paints. This color was a blend of a darker forest green and a lighter green. Note the bent track lengths for around the front idler wheel and rear sprocket wheels. 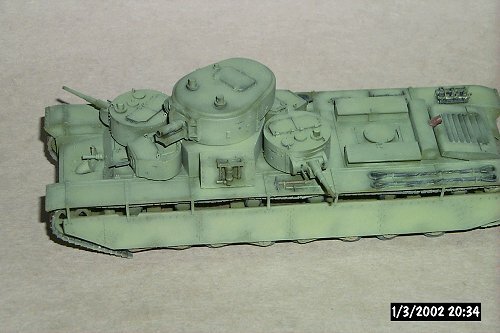 Taking into consideration "scale-effect" this is a reasonable base color for pre-war soviet AFVs. This color will be considerably lightened with further painting to represent weather-induced fading of the paint, and dust. As my model was to be mounted on groundwork with figures, weathering was a must, though I dont believe that you must weather every model you build. The biggest problem with construction is that the four sub-turrets were too large for the hull by several millimeters. I did not measure whether the turrets are too big in scale or the hull too small. 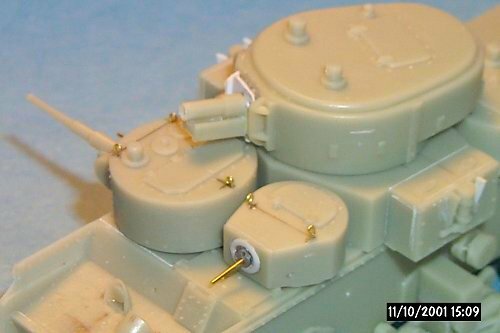 Several millimeters may not seem much, but with such close tolerances of the turrets & hull, the kits turrets could not sit in the center of their hull positions (see Photo 6). On the real T-35, the drivers top hatch could only open with the small mg turret turned to the side due to turret overhang (overhang is not related to a "hangover" due to too inhaling much glue vapor). On Modelkraks model, the small mg turret unfortunately overhangs over the drivers hatch in all positions which it is not supposed to do. This problem can be partly hidden by relocating the turret locating pins, and then by orienting turret weapons pointing in different directions (this also adds to the visual appeal of the display!). The tracks separated from the casting sprue easily with several runs of a sharp knife. To simulate track sag and to get the strips of track length around the sprocket and idler: heat the track sections in very hot water (not boiling) and carefully and quickly bend them around the wheels before the sections cool. Set in cold water once you have the tracks in the shape you want. References for this early T-35 version were slim so I had to rely on other variants for some details. Still, so many small variations in this tank are evident, and over the years there was plenty of opportunity to modify them, that I am not too concerned about rendering one particular vehicle exactly. On the right rear fender the T-35 had a set of spare tracks held on by a unique bracket. This is not included in the kit but adds a lot to an otherwise boring section of the tank. Fortunately, with some copper wire and extra track this can be scratchbuilt. For this model, because it is so well cast, I wished to give it an equally fine finish. Rather than the standard washes and dry-brushing I often do I opted to try a subtle "post-shading" method. I think the effect was well worth the effort. I wish to thank my friend Adam Wilder for his excellent article on this technique, which I have listed in the resources below, and for his personal guidance. The paints used were Vallejo acrylics, which are a European paint that I found very nice to use. The paint was already very thin yet I still thinned about 30% with water on Adams advice and experience. I used an Iwata double-action airbrush set to about 15 psi. This is not strictly a painting and weathering article but I will describe my method a bit in case you wish to try it. Expect this painting and weathering to take two weeks to complete, giving each step time to dry and cure. My T-35 represents an older tank, rushed up to the battlefield over dusty Ukrainian roads in August 1941, with little time for gentle treatment and maintenance. It is going to be dirty and scratched! No primer was sprayed on the model first. I often use flat enamel automotive primer to provide a good base for the base paint. The model was washed in mild soapy water first and air-dried. With a large soft brush I dusted the model before painting, and as needed thereafter. Areas I did not wish to be painted were coated in liquid mask or painters tape. I started with a base coat of a light forest green Vallejo acrylic paint. Several shades of green were mixed to get the shade below in Photo 9 & 11. This light color was chosen to take into account the "scale effect" of objects looking lighter with distance. Several very thin coats gave a better finish with more fine detail showing through. The light spray pattern was no more than a centimeter wide and each coat was more translucent than opaque. Three or four passes were needed to get an opaque layer of green. You will notice that I did this initial coat before gluing on the turrets, side skirts and tracks. Before assembly, the tracks were painted an initial steel color, then given a dark black-brown wash on both sides. 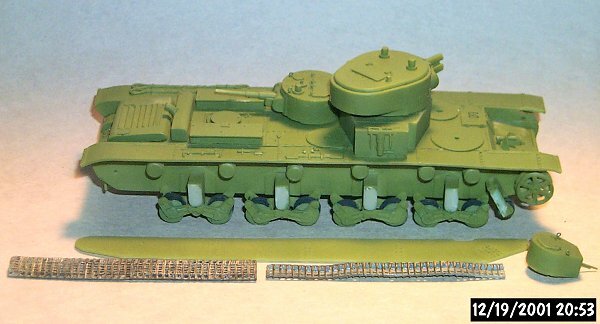 After assembly on the model the tracks were given a light dusty coating to blend them into the base and represent the ground-in dirt of the sandy roads of summertime Ukraine, 1941. The track high points were then highlighted with a soft graphite pencil. Photo 9. The Model with the green base coat, and before painting of tools. The liquid-mask has been scraped off in preparation for eventually gluing on the suspension skirt (in mid-foreground). 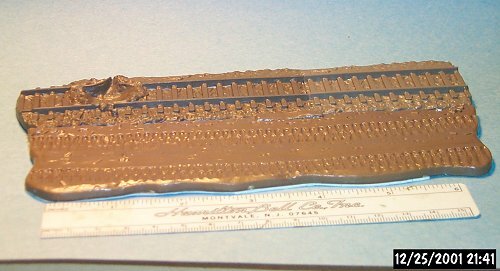 Two lengths of resin track lengths are in the foreground, the right one being bent after heating with hot water to represent a little track sag. This is before applying a wash.
After drying, imperfections in the finish were noted and corrected, then repainted. Now I painted the handtools wooden handles a light brown and the metal tool parts a steel color, and the tow cables a dark gray color. At this point I added what I call a "point wash", also called a pin wash. Rather than an overall wash over the entire model I add the turpentine and artists oil wash to selective points: around each rivet, hinge, hatch, brace & support. This is more time consuming than an overall wash but I did not have to put on a gloss coat over the entire model before a wash, then risk a muddied surface, then have to add a dull-coat to hide the gloss. Any excess wash will be feathered/blended-in with the next "post shading" step. At this step I glued the painted sprocket & idler wheels, tracks and any other remaining parts on to the model, then glued the model to the base with white glue (let the white glue cure for several days). The Post Shading: for this I blended a color several shades lighter of green. The idea was to simulate a weathered paint finish and to accent the features of the model, making it appear more three-dimensional. To do this, I used a fine narrow spray of the lighter green, starting in the center of a panel, turret hatch, turret side or fender section, etc., and working out toward the edges. Leave a more opaque coat in the center of the area and a translucent coat at the edges so the darker base coat shows through. (See Photo 12 & 13 for the post shading.) Keep away from, or keep a lighter coat around the rivets and next to fender supports, and in shadowed areas. I am not fond of post-shading when overdone, but for me it really brings out detail and adds life to a model. It may not be totally accurate, but my answer to this is that modeling is generally an interpretation and subject to "artistic license". 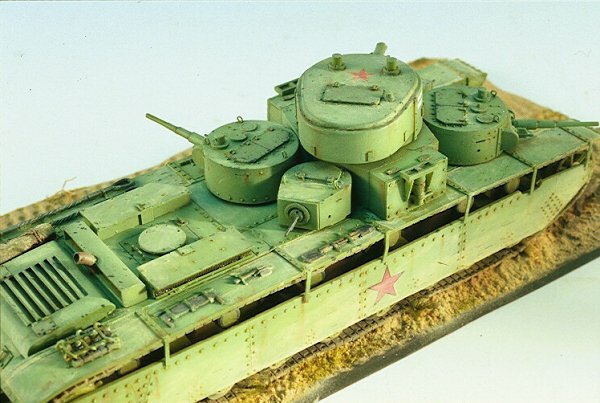 Good weathering can make a model stand out, but again, all models do not need weathering. At this point I applied the markings. With this weathering technique, rub-on transfers or masked marking are preferred so as to dispense with dull-coats. I used the best I could find in this scale to match my references which were 1/72 aircraft decals of Soviet red stars. White rectangles were cut from white decal film for the turret markings. A gloss coat of acrylic floor wax was sprayed on only the areas to have markings, the decals applied, decal-setting solution added, then a light Polly-S acrylic dull-coat was sprayed on only the decalled areas. Each step was allowed to cure before the next step. After the post-shading (as displayed in Photos 12 and 13), now is the time for the mysterious "Filters". A filter is kind of like a wash but is intended for the broad surface of the model rather than the recesses like a "wash". The Filter can be a very thin lighter or darker transparent shade to alter the hue of the paint. It should be very subtle. I refer you to Miguel Jimenezs Rarities World website article on Filters at: http://www.missing-lynx.com/rw/rw.htm for a more thorough explanation of this technique. After the model is glued to the base and the base contours worked to the level of the tracks, finish painting the base in its final color(s) and blend a light spray up onto the lower reaches of the model to blend in the two (see Photo 14). For a final weathering I painted on a light coat of paint pigment powder with a damp brush. Paint pigments are similar to powdered pastels and represent dirt and dust well in scale modeling. They can be purchased from art supply stores. After the pigments have dried, they can be spread with a brush. If you do not like the effect, they can be easily wiped off with a damp cloth or Q-Tip. The chips & scratches! As I study period photos I can see more and more of the chips and scratches that are a common feature of 1/35 model circles these days. The effect is 1/72-1/76 can still be seen though must be smaller and more subtle. As a respected 1/35 scale modeler told me years ago: in this scale you do not leave out the detail, you make it SMALLER. Scratches and paint chipping happen while the vehicle is both clean and dirty. I put chips in before the dust and after adding the dust coating. Some scratches went all the way though the paint, some only through the dust. To represent the chips & scratches I used dark gray paint carefully added in obvious, small wear locations and by actually scratching though the layers of paint with a sharp hobby knife. Chips represent things hitting and bouncing off the vehicle, common on edges; while scratches represent the vehicle scraping against objects it drives by or perhaps crewmen scurrying up & down the tank. Photo 10. The Base: The model is over 13 cm when complete and needed a long base for display, protection during handling, and theft at model shows (yes this has happened to me and others, and a base makes a model that much harder to pocket!). Using extra diorama bases from Matchbox kits, I mated two pieces end-to-end from Matchboxs 1/76 scale M-17 halftrack kits, and a roadway from Matchboxs M-20 tank transporter kit. Photo 11. Oblique overhead view of the Model with the base coat of light forest green, prior to weathering. 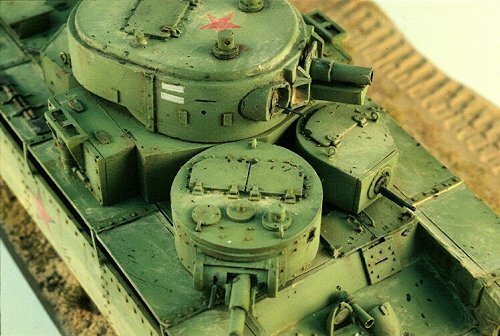 Soviet tanks were supposed to be in a standard dark green though my references state that with wartime quality control, scale effect and weathering, it would be acceptable to use various shades of forest or olive greens. The base has yet-unpainted groundwork added to improve realism of the display. After the base is painted, the model will be glued down with white (Elmers) glue. 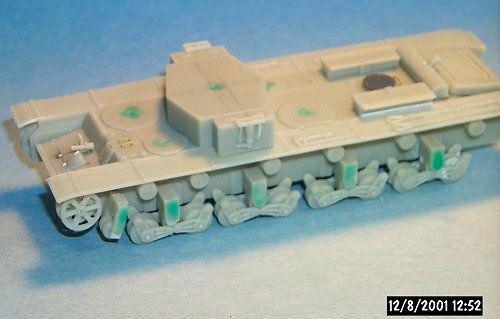 The tank is not centered on the base to allow for a second vehicle and figures of an upcoming diorama. Photo 12. The "post-shaded" model. This is done by carefully and lightly spraying on a green several shades lighter than the base-coat. Start in the center of a panel, fender section or turret top, and slowly and carefully work out to the edge. Give a lighter coat near the edges and around rivets and weld-seams. This coat also blends in the dark wash applied around the corners and hatches. Rather than an overall wash over the whole tank (like I normally do), in this case I applied a small bit of dark turpentine & oil paint wash around each hatch to create shadow (I refer to this as a "point source" wash). More washes will come later. Photo 13. 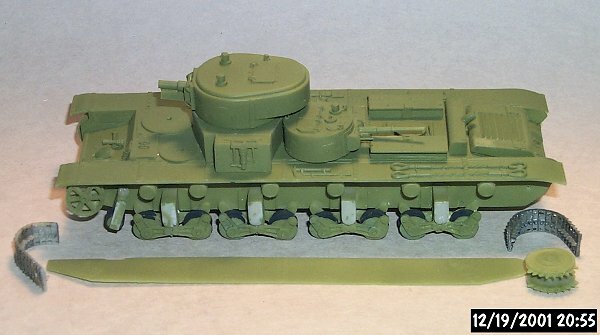 A view of the rear of the T-35, at the same stage as in the above photo #12. This post-shading is a step in really bringing out the model detail and making it more three-dimensional. The recessed areas, such as behind the turrets areas are less prone to fading by the sunlight and wear and thus have less or none of the light post-shading color, to give an impression of being in-shadow. Photo 14. After allowing several days for the shade of lighter green to cure, I applied a light "point" or pin wash to the individual rivets and panel seams. I did this to add depth and accent the superb details of the kit. Red star markings were from a 1/72 scale Soviet aircraft model. The white bars on the main turret were cut from some white decal sheet. Now that the markings are applied and the model glued to the base, the finish weathering can be done to blend the model into the base so they look like they go together. Note that the broken front fender pieces have been repaired. I very much enjoyed this model despite the turret problem and recommend it highly to intermediate and advanced modelers. If I can only con Doug Chaltry out of his Modelkrak T-28 too! I am pleased with the results of the painting and weathering which took considerably longer than the old wash & dry-brush methods. I thank Doug Chaltry, Jadar Models of Poland, and Modelkrak Company for giving me this model to build and review. Russian Tanks and Armored Vehicles, 1917-1945, Wolfgang Fleischer, pg. 64-75. Schiffer Publishing (1999). A very good English language hardcover book. Winter Wonderland Part 1 article by Adam Wilder. AFV Modeler Issue 2, January/February 2002, Newcastle England. 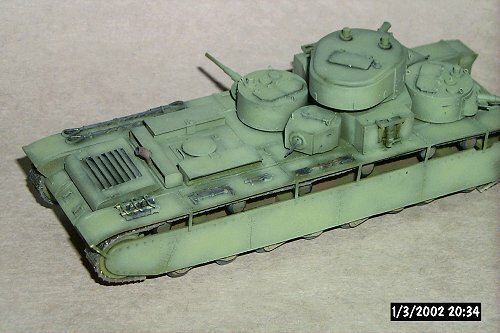 A construction article of the 1/35 DML IS-1 with extensive explanation of the painting & weathering used. The Russian Battlefield website of Mr. Valera Potapov. http://www.battlefield.ru/ This is a superb website for knowledge about all aspects of Soviet WW2 armor and battles, including great coverage of the T-35. AFV News, Interior Views, website. http://www.kithobbyist.com/AFVInteriors/ Another superb website focussing on the interior crew and engine areas of armored vehicles. 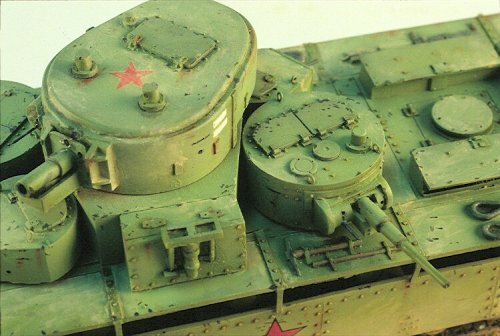 Medium Multi-Turret Tanks of the Red Army from 1930-1941 (T-35, CMK, T-100), Frontline Illustrated. A Russian publication, written in Cyrillic, with English photo captions. Superb scale plans and detail drawings.